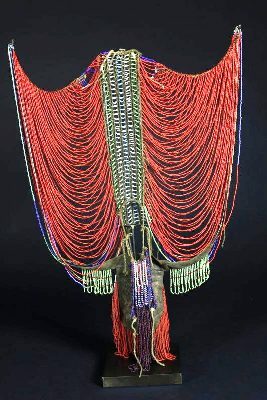 Wrapture - In Western Nigeria a cloth is called a ‘wrapper’ thus becoming a symbol for covering human secrets and shame. I have chosen to concentrate my newsletter this fortnight on an amazingly talented woman who is managing to be significantly everywhere in 2017. Her name is Peju Alatise and she hails from Lagos, Nigeria. Born in 1975 into a large family unit she struggled to get her parents to see value in pursuing an artistic career. But follow her creative path she did; studying architecture, writing poetry and 2 novels and developing her art in various forms and mediums. She has just become the worthy recipient of the very prestigious 2017 FNB Art Prize. 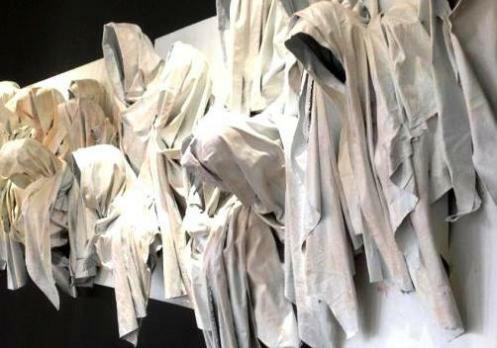 She will have the opportunity to develop a new project to be showcased at Joburg Art Fair in September and will have her own dedicated exhibition space at the Fair. 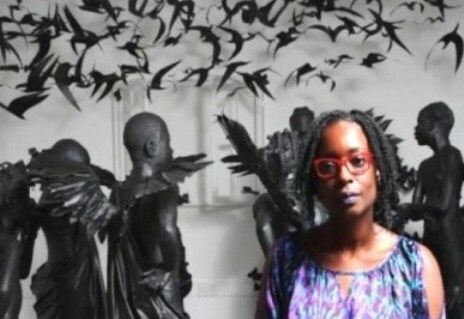 Peju started this year by being one of Nigeria’s 3 chosen representatives for their stand at the 57th Biennale in Venice where she exhibited a large and evocative installation called ‘Flying Girls’. It featured 8 life-sized winged girls who dream of a realm where they can fly. Based on one of her short stories about a 10 year old maid, the work elicited a sympathetic response. This exhibition followed a year as a fellow at the Smithsonian Institute where she concentrated on exploring the ancestry and performance art of Yoruba masquerades. 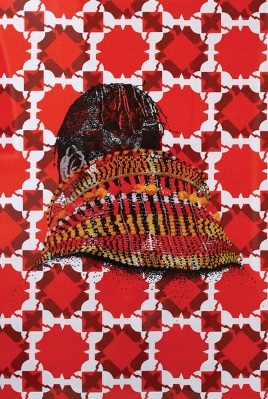 In 2014 Peju achieved a very successful debut at 1:54 Art Fair in London where she highlighted the plight of kidnapped and missing girls in Nigeria with a piece of work called “Missing”. 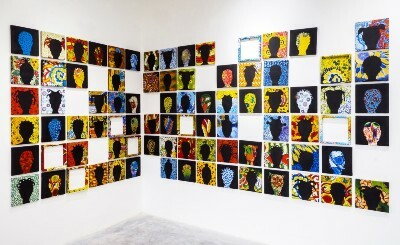 Each piece represented a girl for whom the Government had done nothing about, either to find or to get returned. Peju is passionate about addressing social, political and gender issues. Her work is a search for truth and she is unafraid to tackle sensitive and challenging issues. It is filled with strong narratives about the societal realities of life in Nigeria. In 2014 in an interview she said ‘I feel at the moment my work is a cry in the wilderness. If it is true that art can affect change then I am impatient because it is happening too slowly for me to notice’. 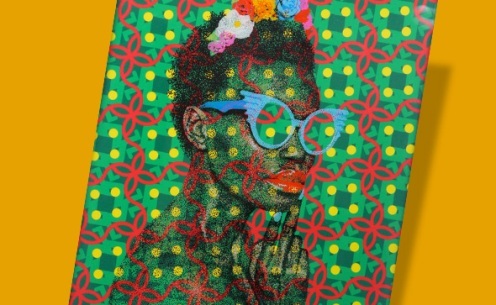 Hopefully, given her rapid rise to the forefront of Africa’s Contemporary Art’s stage, she is feeling more hopeful and still compelled to visualize her beliefs into powerful vehicles of truth … forcing her viewer to engage, reflect and change for the better of all. I look forward with great anticipation to seeing her new production in Johannesburg. 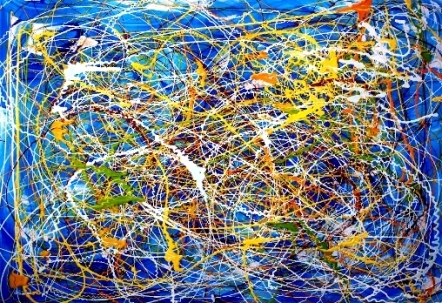 What make abstract art outstanding? 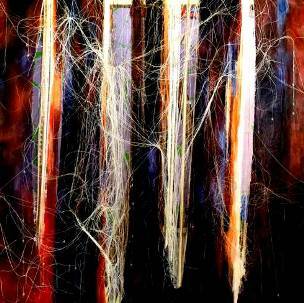 Million dollar question but these abstract pieces by Zimbabwean artist Talent Mapedza certainly do it for me as he explores and intertwines technique and concept together, leaving the viewer traveling a complex visual journey round each painting, searching for meaning while responding completely to its expressiveness. Colour is a key component in his work. He has a sophisticated palette and uses it for dramatic effect … be it moody black or transcendent cobalt blue backgrounds or blocks of vibrant contrasting hues underlying the frenzied line work, splashes and textures that make up his paintings. While he is led by spiritual motivations…connection, desires, forgiveness…he does not take his work so seriously that it becomes morbid. It seems to me that his work is an outpouring of faith, hope and torment all mixed up…but the overriding emotion is passion and positivity and he obviously has a clear mandate to himself to communicate through his art. ‘Mouth Connection’, oil process “When we open our mouths we easily connect and network with people and if we don’t, our silence can make us stronger in deep thinking’. 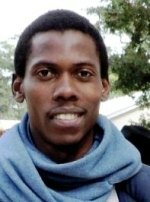 Currently he is a resident artist at the National gallery of Zimbabwe in Bulawayo. 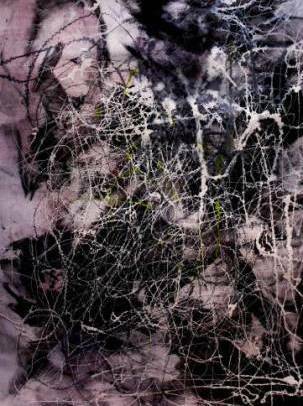 He generally works with mixed media, acrylic, oils, photography and clear vinyl on mirror. In his own words he describes his work thus: ‘My paintings represent the abstract nature of the palette, the air waves and the Wi-Fi that we search for every day constantly. The intangible nature of air waves is represented with my abstract strokes and the nature of air waves by drip and splashes of lines intertwining in the atmosphere’. To be celebrated on the 27th of October at the Smithsonian Institute. This gallery opened its doors in May 2013 and since then has hosted several solo exhibitions of renowned artists from across the continent. The gallery states it ‘is dedicated to presenting the best of 20th-century and Contemporary Art from the African region and its Diaspora and aims to present established and emerging artists to new audiences within the global art market’. I was led to this gallery while researching for a new page for my website called African Patterns. I found this artist Evans Mbugua whose work I find fun, vibrant and dynamic. He celebrates a history of cloth and pattern in a very modern and upbeat way. Have a look! I loved this article; it touched my eternal fascination with cloth and ethnicity. Wafrica combines traditional kimonos with African prints and patterns and together they form an aesthetically powerful, wearable art. You will have found a common thread running through this newsletter which is reflective of the state my mind is in having been researching for a new webpage I am writing called African Patterns – An Ode to my Profession! Keep a look out in the next couple of weeks for this page to be uploaded on www.contemporary-african-art.com. That’s all for now readers, hope you have enjoyed reading this 3rd newsletter from CAA as much as I have enjoyed putting it together!